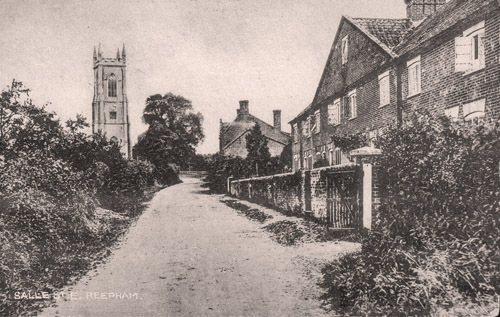 In the late 1800s and early 1900s musical events were a common occurrence in Reepham and were often given to raise funds for more street lighting, church repairs, and other charitable concerns. Concerts in St Mary’s School were given each winter to raise money to supply a quantity of coal to the poor of the parish. Major outdoor celebrations, such as Queen Victoria’s Golden Jubilee in 1887 and Diamond Jubilee in 1897 and the coronation of Edward VII in 1902, would call for the band of the 3rd Norfolk Rifle Volunteers. Various musical groups were formed in Reepham in the Victorian and Edwardian eras, including the Hackford Glee Singers, Hackford and Whitwell Musical Society, Reepham String Band, Reepham Handbell Ringers and Reepham Troupe of Black Diamonds. 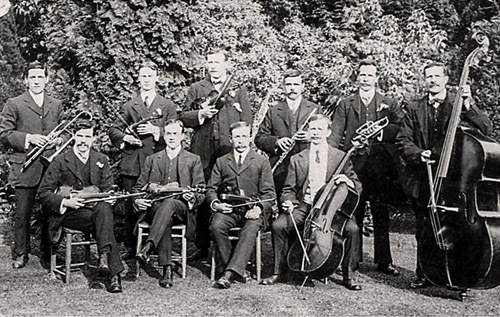 Pictured in the Reepham Life 2019 Calendar for May, the photograph (above) of Reepham Orchestral Band taken in 1910 includes familiar names like Edward Gibbs Jnr; James Dixon from the shop at Towns End Corner; James Wasey, tinsmith; F. Hurn, who later worked for Gibbs; and George Juby, tailor. Arthur Lubbock, on the left of the back row, was a gardener and groom for Reverend Lanchester at Salle Rectory. Next to him, Harry Youngman was a railway clerk and son of Reepham’s stationmaster. 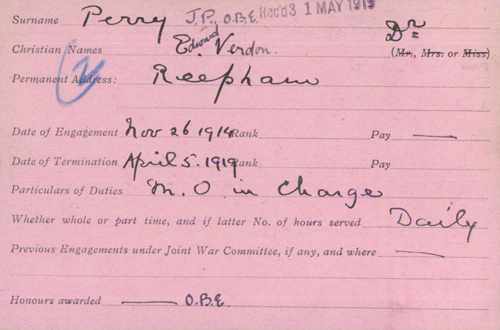 In 1915 he enlisted in the British Army while working as a railway clerk at Stratford goods station. In 1916 Harry had spent two months in hospital at Church Stretton in Shropshire recovering from wounds in the head and neck, but a year later was reported missing and later presumed dead. He is commemorated on the World War I memorial tablet in St Mary’s Reepham, and also on the Cambrai Memorial in Louverval, France. 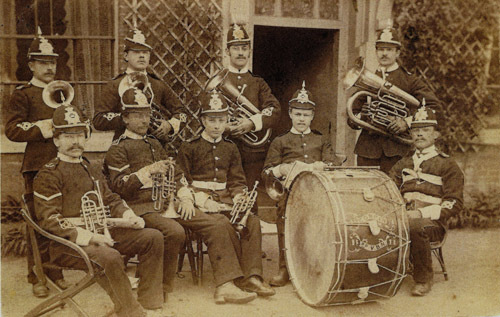 The photo below shows the band of the 3rd Norfolk Rifle Volunteers, established about 1860. Seated, front row (left to right): Thomas Pitcher, William Huggins, Henry Hawes, James Wasey and John Flatman (drummer). Standing, back row (left to right): Alfred Barber (conductor), a visitor, Thomas Morris and Fred Hudson. In the mid-1930s the terrace pictured in the April photo of the Reepham Life 2019 Calendar of eight homes in The Street, Salle, were the homes of the families of Barber, Stearman, Arthurton, Hardesty, Clements and Mallett. Going back through the years some of these names, like Stearman, Barber and Clements, appear in earlier census records. Further back we find the Gladden, Page and Allen families living in The Street, and in 1871 the name Timbers appears in four of the cottages. Through all the censuses most of the occupations, naturally, were related to farm work, cattle and horses, along with a regular blacksmith. Occasionally we find a carpenter, a brick-makers’ labourer, a shoemaker and a fish jobber, and, according to the 1851 census, in the middle of The Street lived a rat destroyer with his wife who was a fortune teller! In 1861, in the middle of the houses in The Street, a William Gladden was running a grocery shop as well as being a farm worker and the parish clerk. In 1881 a few railway workers appear. The longest-running resident seems to have been Joseph Leeds, born in Reepham in 1801, who ran the White Horse inn at the top of The Street for at least 30 years. Each publican running the White Horse was also a farmer of between 20 and 40 acres, usually employing one or two labourers. The surname Leeds was prolific in the Reepham area and it is a difficult task to unravel the various Leeds families since Joseph’s son Stephen William Leeds married another Leeds, Frances Ann, her father being another Stephen Leeds! Stephen William Leeds became the proprietor of the ironmongery business in Reepham’s Market Place and was living there with Frances and their two children in 1881, selling the business to Edward Gibbs in 1888. Frances and her mother-in-law Elizabeth lived on after their respective husbands had died, probably in Church House on Church Hill, Reepham, and were still registered there in 1901. The corner shop at Towns End (currently V’s Café) has had a varied history. The March photo in the Reepham Life 2019 Calendar shows it when it was run by George Grief, selling radios, televisions, domestic appliances and, of course, bicycles. He took over the shop in the 1940s, moving from Wood Dalling, and lived in Reepham for at least 50 years. In its lifetime the shop has also been a grocers and drapers. 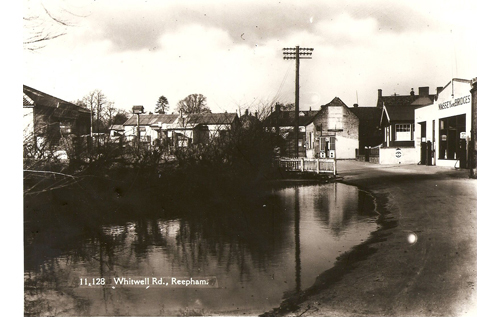 In the 1920S there were at least seven grocery shops in Reepham. Three of these were in the Market Place, one in Back Street, one on Townsend Corner (Frost’s, which later moved to Station Road), one at Station Plain and one at The Moor. The earliest picture in the Reepham Archive shows the proprietor as James John Dixon, who began his working life as a blacksmith in Wood Dalling, later moving to Reepham as a cycle maker. He was an agent for Triumph and also Humber, who were both manufacturers of cycles, motorcycles and later of cars. In 1910 he supplied an electrical landline from his premises to Dr Perry’s garden (Eynsford House) to supply lighting on the occasion of a grand garden fete, where a stage was set up and lit for the first performance of Reepham Black Diamonds. 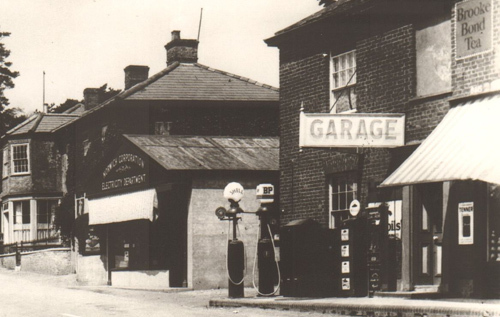 The picture below shows the shop as a grocery store with garage facilities, including petrol pumps for Shell and BP, possibly in the 1920s. The garage building next to it was later acquired by Norwich Corporation Electricity Department. 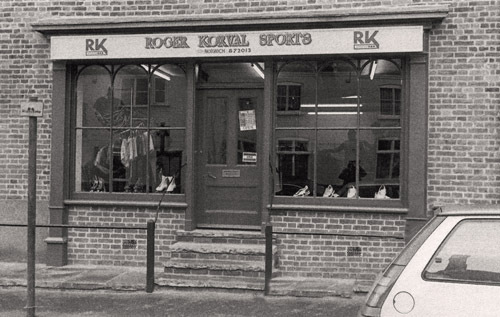 The caption for the February picture of the Roger Korval sports shop in the Reepham Life 2019 Calendar should have read 1980s and not 1960s. The February photo (below) of the Reepham Life 2019 Calendar shows the Roger Korval Sports shop in Market Place, Reepham, possibly in the 1980s. Many Reepham inhabitants will remember that this shop was once an ironmonger’s and seed merchant’s store run by the Gibbs family. 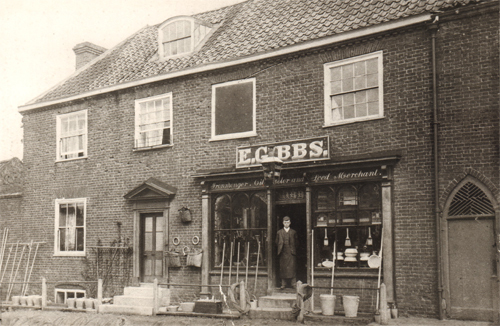 When Edward Gibbs took over the business in 1888 it had been trading for many years, previously by Stephen Leeds and before that by the George family, who were running the shop in the 1830s. The shop front itself remains remarkably similar to the earliest photographs we have (below), including the railings, which are still a feature of several buildings in the Market Place. By the early 1900s Edward Gibbs had expanded into the building next door and his son, Edward Gibbs junior, recounted in a newspaper article how he had to remove 16 shutters ready for the shop to open at 7 am. The shop was open until 7 pm every day, except Thursdays when it closed at 4 pm (half-day closing!) and Saturdays when it stayed open until 10 pm. The article lists items that were once in everyday use: tortoise stoves (so-called because they burned fuel very slowly), larding needles, goffering irons (for ironing frills and ruffles), leather for pump clacks and lamp glasses for oil lamps. A hundred years from today people might be just as intrigued by the objects for sale in Reepham Home Hardware! Reepham Archive has a small selection of items from the shop, including a selection of kitchen tinware made by James Wasey. When Edward Gibbs senior retired he moved into The Laurels (previously Veranda House) on Dereham Road. His son Edward and daughter Marjorie continued to run the business until December 1966. Marjorie is commemorated by the bench that stands near the pharmacy in the Market Place. 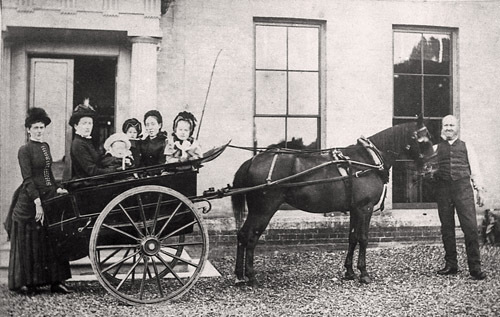 The cover photo of the Reepham Life 2019 Calendar shows the Leamon family outside Whitwell Hall in 1884. In 1871 the farm and tannery business was being run by Robert Leamon, an ardent politician and prominent agriculturist. The farm covered 1,300 acres, employing 38 farm workers with 18 boys and five women, and the tannery business employed a further 20 men. 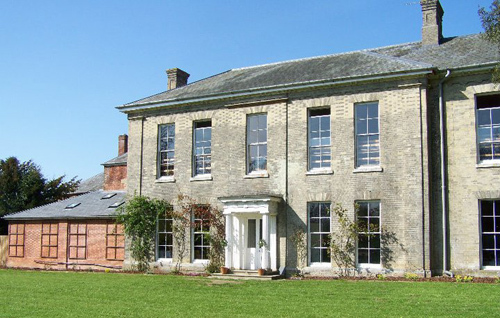 By 1881 Philip had married Elizabeth Reed and was living a typical gentleman farmer’s life at Whitwell Hall, hunting with the North Norfolk Harriers, giving harvest suppers for his workers, being a churchwarden, playing cricket and entertaining the local choir. But by 1884 he was on the verge of bankruptcy and the sale was announced of the Whitwell Hall estate and tannery. In 1887 all the livestock on the Whitwell estate was put up for auction as well as the household contents. In 1888 Philip applied for discharge from bankruptcy, but he had continued to contract debts knowing that he could not repay them. In 1891 there were six children and Elizabeth was teaching them on her own at home at an address in Norwich. Eventually, she was admitted to hospital suffering from melancholia. In 1894, supported by Samuel Bircham and other local dignitaries, an appeal was made for financial help for the grandchildren of Robert Leamon, reminding people how generous Robert had been towards the local poor. The happy band of volunteer firefighters shown in the December photograph of the Reepham Life 2018 Calendar dates from May 1936 when the disused Primitive Methodist Church on Dereham Road had been purchased for the Fire Brigade by Edward Gibbs. 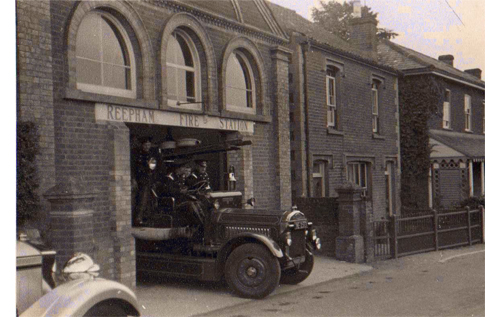 Reepham Fire Station on Dereham Road, possibly late 1930s. Previously the old hand-engine had been stored on land in the area of Old Brewery Lane. Reepham’s fire brigade had been established for about 100 years, beginning with manual pumps carried on a horse-driven van. Putting out a fire required a source of water and one report of a fire in December 1938 tells of the pump being placed at Sun Barn Pit (a large pond that existed in front of the present fire station) with more than 2,000 feet of hose run out through Church Street to the back of the Old Rectory. Inches of ice had to be broken before pumping could begin and several lengths of hose burst, the escaping water turning into sheets of ice within minutes. Whitwell Road showing Sun Barn Pit. The November picture in the Reepham Life 2018 Calendar shows Hackford House (now the Bircham Centre) as a First World War hospital. At the outbreak of the war, the British Red Cross had already secured buildings, equipment and staff, and was able to set up temporary hospitals as soon as wounded men began to arrive from abroad. 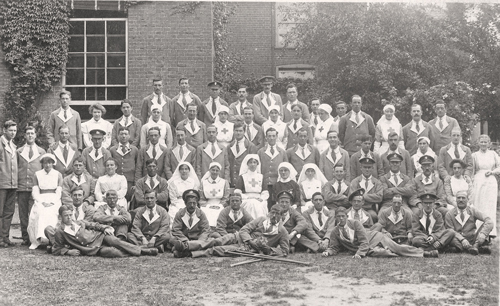 By December 1914, Reepham Red Cross Hospital was in operation as a 12-bed VAD (Voluntary Aid Detachment) Auxiliary Hospital No. 52, the first wounded having arrived at the “Parish Hall from Norwich conveyed in motor cars lent by local gentlemen”. Samuel Bircham had donated the use of the Scouts’ Club Room (at the back of the Bircham Centre garden) as a kitchen facility and later gave permission for Hackford House to be used, which accounts for the number of “Hospital Blues” in the calendar photograph. Permanent staff included a commandant (Lady Grace Barry of Witchingham Hall), a quartermaster, a matron, some full-time nurses and a number of VAD nurses. Many local volunteers from Reepham provided cooking, cleaning, laundering and night-duty support. Each volunteer had a record card and the card of Nan Bircham (Samuel Bircham’s daughter-in-law) is shown below. 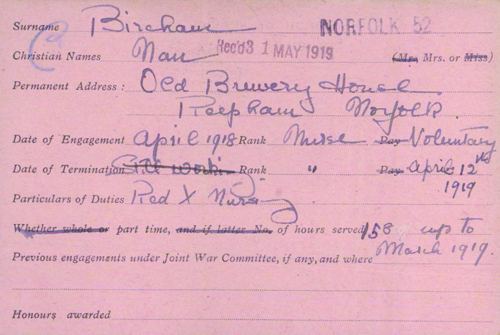 Her sister, Dorothy Bruce, is also on the list, and although she gives a Norwich address, we can probably assume that she spent some nights at the Old Brewery House, where Nan lived with her children Merrick, Michael and Ann. Also pictured is the card of Dr E.V. Perry, medical officer-in-charge, who lived at Eynsford House. The October picture in the Reepham Life 2018 Calendar shows several cyclists in Reepham’s Market Place, photographed after 1987. A bicycle was an ideal means of transportation as it was comparatively lightweight. It could be carried over obstructions and, as well as being ridden, could be loaded with equipment and pushed. A motorcycle was faster, but a bicycle was silent. Volunteer cyclist units started in Great Britain in the 1880s. The official Army Cyclist Corps was formed in 1914. In the early days military cyclists proved their worth, and there were numerous reports of their bravery in the British cycling press. 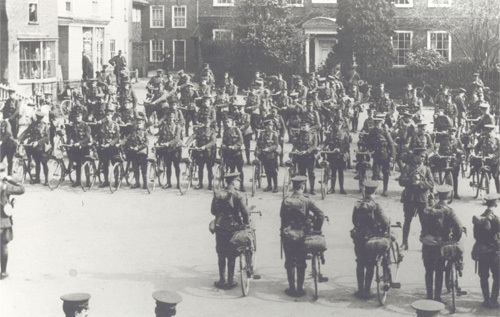 But trench warfare forced the reassignment of soldiers from cyclist units to infantry units, and although bicycles were still used extensively throughout the war by all sides, there was less need for actual cyclist units. 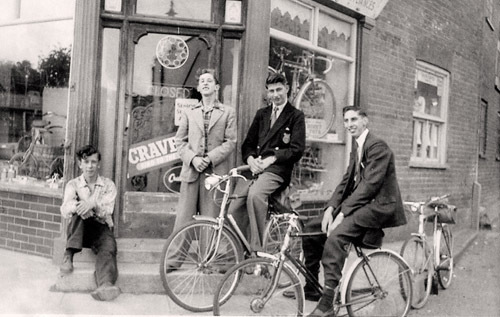 A cyclist’s duties included reconnaissance, security patrols and courier work. Cyclists were used to cycle along communications trenches, which was particularly important if the security of the trench telephone system was found to have been compromised by enemy receiving stations. 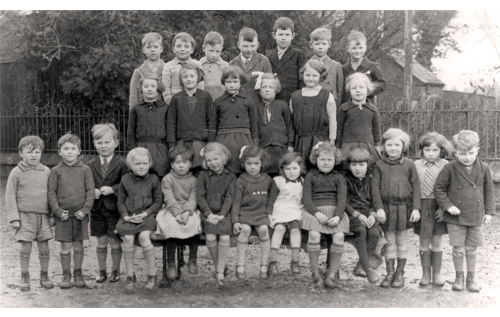 The September picture in the Reepham Life 2018 Calendar shows the Reepham Primary School Class 2 of 1937. Hackford and Whitwell School was built on the current site of the primary school in School Road, Reepham, in the 1890s, replacing the previous school building in Church Street, which is now the Town Hall. The present Town Hall had been the original Hackford and Whitwell Parochial School dating from the 1860s and paid for by subscription. With a rising population the Church Street premises had become too cramped for the increasing numbers of children. Reepham parish also had a school – St Mary’s on Norwich Road, where Richard Cornall was the headmaster from 1896 (taking over from Susan Goddard) until 1912. Entries from St Mary’s log book show the importance of attendance in relation to funds granted to the school by the School Board. Regular visits were made to check on the attendance registers, which had to be marked by a certain time each day, morning and afternoon. Regular inspections were also made, often unannounced, by school inspectors to check on pupil attainment and quality of teaching. Funds granted relied on the results of these inspections. Later entries show that by 1914 there were approximately 50 pupils on the register. Numbers continued to dwindle and Reepham St Mary’s school closed around 1920, amalgamating with Hackford and Whitwell, although the building continued to be used for woodwork and cookery classes by other schools in the area. The log book also records school closures on account of measles, whooping cough, cases of ringworm, non-attendance due to bad weather and bad boots! Reepham St Mary’s log book is available on the UK-based online genealogy service Findmypast and, like the curate’s egg, is good in parts. For a more detailed look at Hackford and Whitwell School in the 1920s and 1930s refer to Wesley Piercy’s booklet My Town: Essays on the History of Reepham. 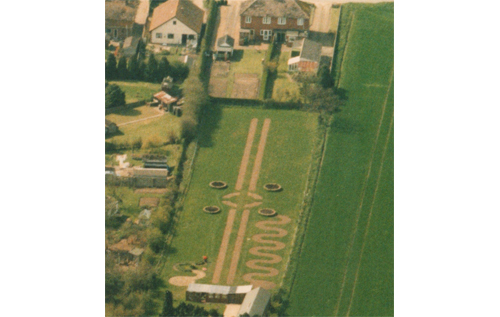 The August picture in the Reepham Life 2018 Calendar shows the Cawston Road/Wood Dalling junction as it was before the new houses were built on Crown Meadow. On the site of the former Reepham Railway Station can be seen the old granary buildings (now Kerri’s Farmhouse Pine), the station building itself and the disused railway line leading down the view, which has become Marriott’s Way. The group of small modern industrial units next to the station, known as Coller’s Way, was named after R. Coller & Son, coal and corn merchants, with the large older building (now Reepham Garage Services) still showing some old signs. Other businesses based at the yard were Stimpson & Hurn and William Freeston. The bridge that took the road over the railway line is now a footpath. One of the highest points in Reepham, it was used as a lookout post by air raid wardens in the Second World War. Part of the original road still exists behind the wooded area as the road bends round towards Cawston. Six roads met at what was once called Station Plain. However, the railway reduced it to five by making the Wood Dalling and Cawston Roads use the one bridge. 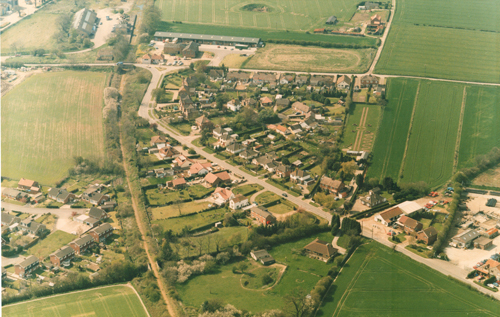 In the 1901 census this area near Reepham Station was still called Six Crossways. The main buildings here were The Crown Inn with a few surrounding cottages, one of which was a laundry business run by Matilda Timbers. In the 1920s Philip Hunt opened a general supplies store and pork butcher’s, moving from a previous site in Reepham Moor. This later became Station Stores (now The Cutting Station hairdressers). Does anyone know what and where these patterns were?